Nothing lasts forever, but o-rings can break down and fail before their time. If you’re not getting the life from your o-rings that you should, consider the following common reasons for O-ring failure. Keep in mind that most o-rings fail due to a combination of causes. This is not meant to be a complete troubleshooting guide, as the causes of seal failure are often complex. In compression set, the O-ring is squashed into a flat-sided oval. It doesn’t recover after the stressor is removed—it has permanently “set” into the deformed shape. Compression set is one of the most common causes of O-ring failure. What are some ways to prevent it? Use an O-ring material with low compression set and/or high temperature resistance. Check the gland design to make sure the O-ring isn’t over-compressed. Reduce system operature temperature if needed, and alleviate excessive frictional heat build-up at the seal face. Extrusion occurs when high stresses force the O-ring material into the clearance gap between the mating flanges. Pulses of high pressure cause the clearance gap to open and close, trapping the O-ring between the sharp edges. This causes physical damage called “nibbling”. The edges of the O-ring on the low pressure side will have a chipped, chewed or frilly appearance. Extrusion and nibbling usually occurs in dynamic applications like hydraulic rods and piston seals. High pressure in excess of system design and tolerances is a common cause of extrusion, as are excessive and/or irregular clearance gaps. The O-ring material may be too soft, or the O-ring installed too large. Reduce machining tolerances to decrease clearance. Ensure installation of correctly sized O-rings, and try a harder material if necessary. Use backup devices to reduce clearance gaps. In some cases of extrusion and nibbling, O-ring size and shape is the problem. For sealing applications with unusual geometries, custom-made O-rings, like those offered by Kalrez®, may be an appropriate solution. Abrasion occurs when there is repetitive contact between the O-ring surface and the housing. The excessive friction wears down the sliding contact faces of the O-ring, resulting in wear lines or even deep scratches and breaks. The surface may look dull or glazed, and one side of the O-ring will be worn flat. Abrasion is common in dynamic applications that involve rotary, oscillating or reciprocating motion. Inadequate lubrication, improper surface finish on metalwork, abrasive particles in the system fluid, and excessive temperatures can all cause abrasion. Ensure adequate lubrication and the correct surface finish on metalwork. Check the system fluid for contaminants and install filters, wiper or scraper rings if needed. Consider changing to internally lubricated O-rings and/or an O-ring material with higher abrasion resistance. Explosive decompression, also called gas expansion rupture, occurs when high pressure gas becomes trapped within the internal structure of an elastomer seal. 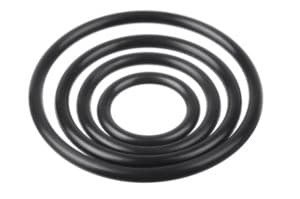 When exposed to high pressure gas at high temperatures for a long period of time, the O-ring’s polymer compound may absorb the gas. When the system pressure drops, the trapped gas expands to match the external pressure, causing surface cracks and blisters as the gas escapes. A small amount of gas may have little effect on seal integrity, as the blisters may recede after the pressure equalizes. Excessive trapped gas may cause severe damage of even total rupture of the O-ring. Increase time for decompression and/or reduce system temperature. Choose an O-ring material that is resistant to explosive decompression. Use an O-ring with a smaller cross-sectional size. Many chemicals will react with certain O-ring materials. Degradation occurs when the O-ring material is unable to withstand attack from a chemical it’s exposed to. Elevated temperatures, excessive stretch or compression, and/or mechanical stresses can all accelerate chemical attack. A degraded O-ring may show discoloration, blistering, cracking, and/or a change in shape or hardness. The specific indications vary by chemical reaction. Choosing the correct O-ring material is key to preventing chemical degradation. For the best chemical resistance in high temperatures, the gold standard is perfluoroelastomer (FFKM) material. Kalrez® FFKM o-rings resist attack from more than 1,800 industrial and electronic grade chemicals, solvents and plasmas while offering high temperature stability. Chemically induced swelling occurs due to an incompatibility between the O-ring material and the media it’s exposed to. The seal absorbs the media, growing in volume to the point of malfunction. The swelling may occur across the entire O-ring or only in places that are exposed to the chemical. The swollen O-ring may extrude out of the seal grooves. The only way to prevent this problem is to use an O-ring material that’s chemically compatible with the system environment. Consult chemical compatibility charts and don’t hesitate to consult a sealing material expert. Kalrez® o-rings resist extreme volume swell when exposed to steam, sodium hydroxide, concentrated nitric acid, ethylene diamine, and many other chemicals and solvents. The main heat-related causes of seal failure, hardening and embrittlement occur when the application temperature exceeds the maximum temperature rating of the seal material. It can also occur due to excessive temperature cycling. The seal material hardens and oxidation causes the seal to crack. The surface of a heat-degraded O-ring may appear pitted or cracked, especially on the areas with the most exposure. This problem often occurs in conjunction with compression set due to a loss of elasticity, so the ring may appear flat. Use an elastomer O-ring with high temperature resistance. Kalrez® FFKM o-rings deliver outstanding high temperature stability. Even after long-term exposure to temperatures up to 327°C, Kalrez® FFKM o-rings retain elasticity and recovery properties better than other high temperature elastomers.